It could be really interesting for your members to have an idea of how many times a subject has been viewed or read. Unfortunately, Drupal does not provide this in the default forum module, but it already provides some key features that helps integrating this views count really nicely and easily. The following article asserts that you already know well or understand how the hook and theme system of Drupal works. If not, you should consult the Drupal Theme and How to use the Theme layer in Drupal 6 documentation. Go to your Site Building, Modules menu and enable the Statistics module, if it is not already done. You don't need to download any additional package, as the Statistics module is bundled with the core package of Drupal. 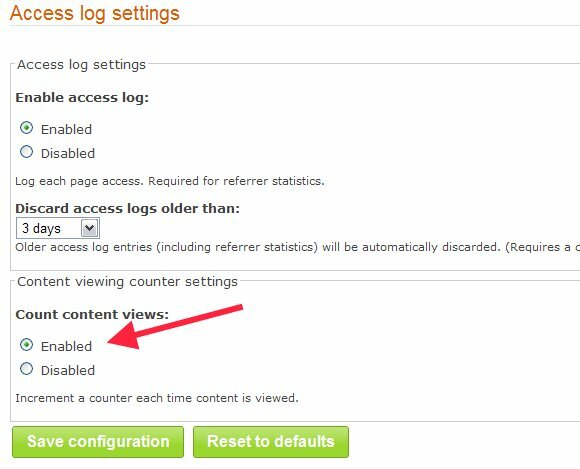 Note that if your forum exists since a long time and you've just enabled the Statistics module now, the view count will unfortunately start from now..
Then, once it is enabled, go to Administration, Reports and Access log settings, and check the Count content views option. Starting from this point, each time someone consults an existing node, a related counter will be incremented. Optional: You could also display this information in the links (generally at the bottom of a node) of a node by enabling the view post access counter rules in User Management, Permissions. Datas are now stored and automatically updated. This was the first and most important part. You now need to theme your existing Drupal theme. First, modify your existing template.php file, and add the method below. // Create the tablesorting header. First, we recreate the table header, and stores it to the $variables['header']. Secondly, we created a new attribute, called views_count, that will store this value. Third, we put the content of $topic->created in $topic->last_reply is this one is empty. It ensures to have an interesting data in the last column, that we renamed from "Last reply" to "Last Post". This is of course optional, and you can remove this code if you wish. Flush your cache every time you add a new hook function, else Drupal won't be able to detect new improvements. Then copy the following forum-topic-list.tpl.php file to the root of your theme folder. You can notice that we now use the $topic->views_count instead of the previous column. * Theme implementation to display a list of forum topics. *   information. If you need to change this, @see template_preprocess_forum_topic_list(). * - $pager: The pager to display beneath the table. * - $topics: An array of topics to be displayed. * - $topic_id: Numeric id for the current forum topic. * - $topic->icon: The icon to display. * - $topic->title: The title of the topic. Safe to output. *   explanation and a link. * - $topic->zebra: 'even' or 'odd' string used for row class. * - $topic->num_comments: The number of replies on this topic. * - $topic->new_replies: A flag to indicate whether there are unread comments. * - $topic->new_url: If there are unread replies, this is a link to them. * - $topic->new_text: Text containing the translated, properly pluralized count. * - $topic->created: An outputtable string represented when the topic was posted. * - $topic->timestamp: The raw timestamp this topic was posted. <a href="/user/login">Login</a> to create a new topic in forum. As you can see here, this template file is really similar to the default one, instead that we use the new $topic->views_count variable. Finally, if you like our FSR theme, here is an CSS snippet that will help you to reproduce this style in your website. That's it, you now have a new useful Views column in your Drupal forum! See you soon for the next Drupal tip! Fantastic tutorial. Helped me a lot. Just wanted to say thanks. A tiny improvement : specify where template.php is located. I've added to the article the place where the template.php file is located. Great article. I loved it and it helped a lot. Only question is, what if you want to see the topic author in the columns? By the way, a small tip for any others that had this problem. When I did the above changes the forum column titles were all shifted to the left by one space. This is because I also have graphical icons for the folders from advanced forums. I just added an extra column called "status" in the array here. Hi, there. first of all, thanks very much for your such kind of great tutorial. that's great help; thanks very much; I did follow the tutorial from step by step; but finally I didn't get the view showing on my site? confusing.....still the same as the original; Would you give me help for this? thanks in advanced. hey there i've been lurking on the discussion boards and just wanted to chime in and make you aware that you are RSS feed wasn't working properly a sec ago. Is it working normally now?